The fund’s objective is to provide absolute returns with a moderate risk-return profile and low correlation to equity markets and other investments. 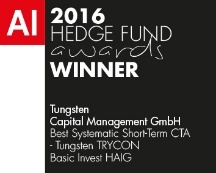 Tungsten TRYCON Basic Invest HAIG is a systematic, UCITS-IV-compliant CTA fund with daily liquidity. It seeks to achieve its objective predominantly through the implementation of our proprietary QuantMatrix models. The strategy trades some 40 global equity, bond, interest rate and currency markets, using regulated, liquid and exchange traded financial instruments. Both long and short positions can be held seeking to profit from identified trading opportunities. The strategy and its strict risk management are based on a clearly defined set of rules, adjusting the portfolio dynamically to changing market conditions. Michael‘s primary focus besides portfolio management is programming and development of the proprietary portfolio and risk management software based on Matlab. He is also a member of the executive board at TRYCON G.C.M. AG since the year 2002. At TRYCON, he was been responsible for the investment strategy of the two Luxembourg domiciled funds launched in 2007 and 2010 respectively. Besides portfolio management, Pablo’s focus is research and development of multi-asset trading strategies particularly for exchange traded derivatives with particular emphasis on sophisticated quantitative models. But trend following models and option trading strategies are another key area. He is also a member of the executive board at TRYCON G.C.M. AG since the year 2002. At TRYCON, he has been responsible for the investment strategy of the two Luxembourg domiciled funds launched in 2007 and 2010 respectively.